For the condition that occurs causing characters to shake back and forth while immobile, see Paralyze. For the effect when a shield is hit, see Shieldstun. 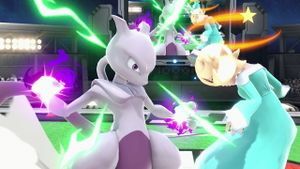 Rosalina stunned by Mewtwo in Ultimate. Being stunned or dazed (referred to as FuraFura in Super Smash Bros. Melee's debug menu and in-game files for Brawl, after the Japanese onomatopoeia for dizziness), an effect known as dizziness in Brawl, is a special condition that leaves a character immobile for a short period of time. Mario's stun animation in Melee. A stunned character is dazed for a few seconds and cannot perform any actions. They can only naturally recover by waiting for the condition to end. Button mashing and shaking the control stick reduces the duration of the effect, and suffering any amount of knockback ends it prematurely. Since Brawl, characters were given a short animation showing them regaining consciousness. Unlike most other status effects, characters are stunned longer at lower percentages (whereas sleeping, for example, lasts longer at higher percentages). In Smash 64, the base time in frames that a character is stunned can be determined by the formula (400-damage)+60. Stun is accompanied by a cartoony tweet sound effect that loops until the condition is stopped, as well as small stars that occasionally pop up around the character's head on top. This sound effect debuted in Melee, and its volume was increased in Brawl. In all games, characters also have a flashing red overlay applied to their model; in Smash 4 and Ultimate, however, this only happens when a character's shield is broken. Also, in Smash 4, a halo of stars appears around a stunned character's head. In Ultimate, the number of stars is reduced to 2, but a solid orange halo appears around the character's head as well. It is impossible to be stunned while airborne. Possibly as a result, any airborne state induced upon a stunned character will cancel the stunned state immediately and they will enter a normal midair state. In Super Smash Bros. 4, hitboxes that have the stun effect are weight independent, acting as if the target's weight is set to 100. However, knockback resistance (such as from the Metal Box) is not ignored, so the attack will fail to stun the target if it doesn't deal any knockback. Reflector shattering Attempting to reflect a projectile that deals above a certain amount of damage will shatter the reflector and stun its user. Shield break If a shield's HP drops to 0 or below, it will break and the user will be stunned. In Wrecking Crew, getting trapped in a barrel and taking heavy damage will occasionally result in the trapped character being stunned upon breaking out. This can only be done with low-knockback attacks, however. Rosalina stunned in Smash 4. Mega Man stunned in Super Smash Bros. 4. Bowser is the only character in Brawl to lack the tweeting sound effect while he is stunned. The reason for this unique property is unknown. When Samus is stunned, her Power Suit starts to short-circuit, causing erratic and almost glitch-like movement. In Super Smash Bros. Ultimate, the Zap-Floor immunity spirits state that the user becomes immune to stun attacks, this is technically incorrect as it actually prevents users from being paralyzed rather than stunned. This page was last edited on April 9, 2019, at 13:24.